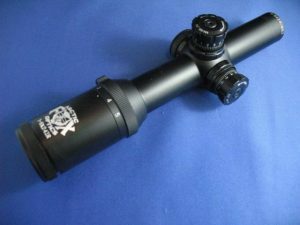 Amidst the constant discussion about shooting, the current darlings of the sport are varmint and long range shooting, with high magnification scopes taking up a large portion of the discussion. Consequently, many rifles are bought or built to suit this burgeoning area of the sport. However, owners may find that these rifle and scope combinations are less than ideal for other types of shooting. The bulky outfits that shoot so well at long range suffer from certain shortcomings when quick shots are required at fast moving game animals at close quarters. Turning your 6 – 24 powered varmint scope down to 6 power and adjusting your parallax to suit doesn’t quite cut it as a field expedient. What are we looking for in a scope for closer range work? Well, lower magnification is a good start, but not the be all and end all of the solution. Another major consideration is field of view. The field of view is what you can actually see through your scope, usually expressed as width of the field in feet at 100 metres. For example, the field of view of our Arctic Fox VT-01 62450 IR at 24 power is 5.1 feet, while at 6 power it is 17.8 feet, a considerable difference. Our Arctic Fox NSN15-1624 IR scope at 6 power has a field of view of 19 feet. At 1 power, it has a field of view of 121 feet, giving a considerable advantage to the lower powered scope when trying to find game. The third part of the equation is eye relief. There are two parts to this. One is the actual length of eye relief, that is, the distance between your eye and the eyepiece when you can see the full field of view through the scope. The other is how critical this distance is. Lower powered scopes tend to have non critical eye relief, meaning that there is a range where your eye can see the full field of view, whereas higher powered scopes require your eye to be at a set distance or the field of view slips away. Another requirement is a plain, non-fussy reticle which is prominent and easily picked up in low light situations. 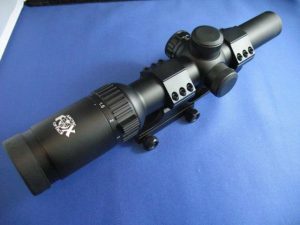 The Arctic Fox NSN15 -1524 IR scope has a prominent vertical bar, with matching heavy side bars, and a central dot with a circle, which is ideal for fast target acquisition. Two of the mentioned scopes have been reviewed by the Guru, Nick Harvey from Sporting Shooter magazine and these reviews can be seen on our website. Check out our products section for more information. Our Arctic Fox NSN15-1624 IR has a Mil Dot reticle. Both of these scopes also feature illuminated reticles for low light use in red and green.